Storage Capacity: 256GB. Product Type: Micro SDXC UHS-1. Product Manufacturer: SanDisk. 10 Year Limited Warranty. We are not responsible for incompatibility issues. before purchasing. You can even capture detailed 4K UHD video. 1 X SD Adapter. 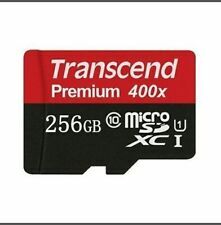 A 256GB flash memory card can be used to store videos, pictures, and data on your phone or other devices. The 256GB is more storage space than a typical phone will have built-in, making it a convenient means of long-term or expanded storage. 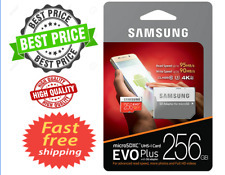 You can find a variety of 256GB cell phone memory cards within eBay's online collection. How do you choose the right 256GB card? 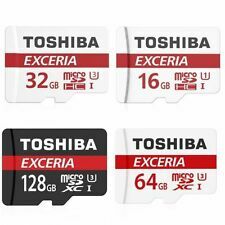 Type: SD cards are by far the most common type, but some older phones may accept other types, such as Sony Memory Stick as well. 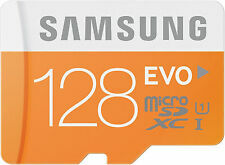 Size: SD cards specifically have three different sizes: the standard size, the mini size, and the micro size. Micro cards are the most common in phones. If you need to transfer data from a micro card to a standard SD card slot, then you will need to use an adapter. An adapter may also come with certain micro cards. 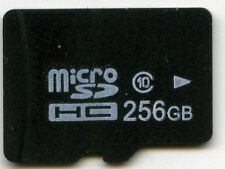 Data transfer rate: SD cards have several different speed classifications, depending on the type of interface. 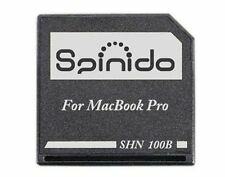 Apart from the standard interfaces, some SD cards have a high-speed or an ultra high-speed bus interface. The ultra high-speed bus interfaces can be identified by the names UHS-I, UHS-II, and UHS-III, with each interface providing increasingly higher data transfer rates. What is the speed class rating? 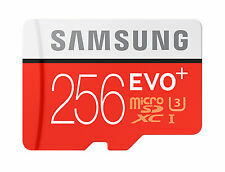 The speed class rating is a way to determine the minimum read and write speed of an SD card. It is related to, though not the exact same as, the bus interface. The standard speed class rating has different classes between two and 10, typically written on the surface of the card. Class 2 has a minimum speed of two megabytes per second, which is suitable for standard-definition video. Class 4 and Class 6 are more suitable for high-definition 720p and some 1080p video. Class 10 is suitable for high-quality 1080p video. A second type of speed class rating is proprietary to the UHS interface. It can be identified by the terms U1 and U3 written on the card itself. U1 is essentially equivalent to Class 10. But U3 has a minimum transfer rate of 30 megabytes per second, making it suitable for both 1080p and 4K video at 60 or even 120 frames per second. Flash memory is a type of long-term electronic storage medium that has no moving parts. It is resistant to physical shocks or disruptions that could otherwise interrupt the data transfer process in portable devices. Another advantage is its fast transfer speeds.